The biggest category (22%) was Other Celebrity Chef — in this bucket are mentions of a myriad of talented chefs like molecular gastronomy pioneer Grant Achatz, master of Mexican cuisine Rick Bayless, Hawaiian specialist Alan Wong and the woman who needs no introduction, Julia Child. There were a large number of wonderful chefs mentioned here, but in the interest of making the graph legible, I lumped those with fewer than three votes in this category. The takeaway: our readership community has a refined and open-minded palate. Please feel free to invite me along on your next expensive culinary excursion. I would very much enjoy dining with you. It seems that many of you are married to men who are handy in the kitchen. Given an open-ended choice, 17% of you chose to stay home and have your husbands do the cooking. Please reveal details on how you were able to procure such gastronomically gifted spouses. Mothers and grandmothers followed closely, with Bobby Flay (7%) emerging as the leader of the celebrity chef pack. 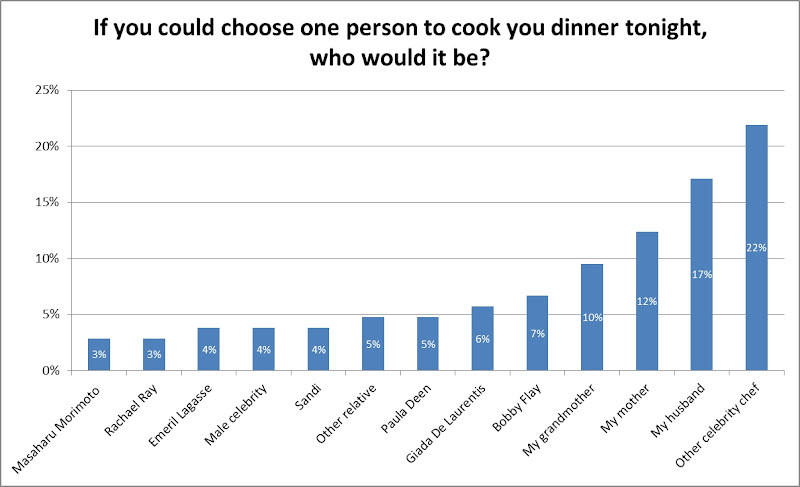 The other obvious conclusion from the data is that I am personally more popular (4%) than Rachael Ray (3%) and Masaharu Morimoto (3%), despite never even having been invited to participate in the studio audience of a cooking show. I also enjoyed exploring the Male Celebrity category, where some of you indicated you would choose a T-shirt-optional Matthew McConaughey, Ryan Gosling or Zac Efron (over 18; I checked). One person chose Martin Luther King, Jr. and though I didn’t find any references online to his culinary prowess, the company would more than compensate for that. Thanks for participating; can’t wait to learn more!